The A X L E B A R is finally here! Made right here in Melbourne, this beast is the latest addition to our Specialty Barbell range. 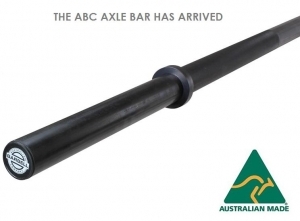 Unlike inferior painted/powder coated alternatives, the ABC Axle bar features a classic knurled grip and our tried and tested black nitride finish. Test your grip and save your shoulders and wrists with this classic strongman bar.